Spinning reels are the most popular fishing reels used by fishermen across the globe. They are easy to use and are very versatile. They are ideal for long distance casting, great for light lures, a wide range of baits, and do not backlash. 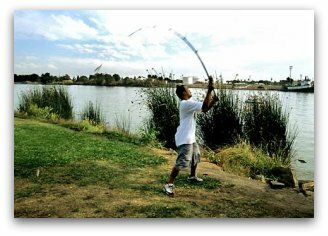 Spinning reels are opened faced reels with a fixed spool that does not revolve during the cast or retrieve. Line is retrieved by turning the reel handle, the bail revolves around the spool, and the line is placed evenly onto the spool. These reels are available in many different sizes. They range from the use for small panfish with the lightest pound test lines, to heavy duty line for trolling or surf casting. As with any other set up to be rigged on a reel, the lighter pound test of fishing line that you can get by with, the better it is for your chances of catching fish. But that just depends on what type of fishing that you will be doing. High gear ratio reels are much better than low gear ratio reels for continuous casting and retrieving. If there were one type of gear ratio model to choose from for your budget, a medium speed gear ratio of about 4:1 to 5:1 is what I like to recommend. 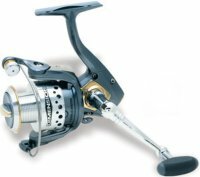 The more ball bearings a reel has, the smoother it will perform. But that's not always true. Why? Well, because some reels are made with cheap bearings. Therefore, you ought to look for anti-corrosion bearings when selecting a reel. A minimum of 4 bearings is what I preferably recommend. I also recommend to choose a reel with an anti-reverse locking handle. This will ensure a proper hook set without the reel spinning backwards, which may cost you to lose fish. Quick Tip: Apply tension when filling the spool with fishing line. This will eliminate most potential tangles when casting. And there's no need to overfill the reel. You should leave about 1/8 of an inch of space at the spools' lip. It's better to concentrate on accuracy at first, rather than distance. Keep your eyes on your target during your casts, while staying aware of your surroundings. It's often best to practice at home first. For maximum distance, allow your bait to hang about 18 inches from the tip of the rod when you cast out. This will help create a whip lashing motion that exerts energy through the rod when casting, rather than just you, which results in longer casts. To begin a cast, grasp the line with your index finger and firmly hold it against the rod. Open the bail using your other hand. Hold the rod with the rod tip facing behind you. With your eyes on the target, make a forward cast by swinging the rod tip forward and releasing your finger free of the line at around the 10 o' clock position. When your cast is complete, close the bail. Turning the reel handle will automatically close the bail for you. However, it's best to close the bail manually with your hand. This preserves the life of your reel, limiting the effects of wear and tear. Good fishing reels should last a lifetime with proper care and maintenance. Keep your reel free from sand and dirt. Store in a dust free environment or/and use a protective cover for you equipment, just like this spinning reel cover. Lubricate your reel and its parts as needed, but sparingly. Use recommended reel lubricants rather than WD-40. WD-40 clunks up over time which ruins your equipment and does not allow for smooth casts and retrieves. Reel Magic is a very good brand that is versatile for so many other uses as well. Spinning reels were in use in North America as early as the 1870's. 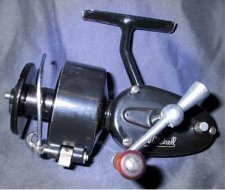 In 1948, the Mitchell Reel Company of Clause, France introduced the Mitchell 300, oriented with the basic design that we see today with the reel mounted to the fishing rod and the spool facing forward. There are hundreds of other reel manufacturing companies. Some of those include Abu Garcia, Shakespeare, Shimano, and Quantum, just to name a few.